Further information about Kamm and his cult can be found on the following websites. Sharing these cyber addresses does not imply endorsement of all online content on linked sites; they are provided to assist further understanding of the issues raised by this website and the book, "a WOLF among the SHEEP". This US-based not-for-profit group has an exhaustive database of information about cults. Rick Ross, the Executive Director, is an international expert in the field. the early 1990s to keep tabs on Kamm - and to warn the public about the false prophet. Wally has endorsed "a WOLF among the SHEEP". ".....This is a book that deserves to be read. It should also be standard reading by our politicians, police and anyone who has to deal with these kinds of issues, as the growth and influence of these kinds of cults continues without pause..."
after reading "a WOLF among the SHEEP". ".....For those who consider that everything about William Kamm has already been published in either my little article or elsewhere, they are sorely mistaken. It wasn't until I discovered all the unreported information published in "a WOLF among the SHEEP" that I realised the extent of the dirty linen in Kamm's closet, e.g., alleged anomalies in financial dealings (which perhaps left many stuck in financial limbo) and other allegations involving commonwealth and state funding. 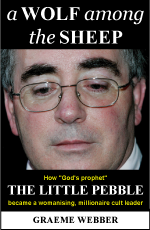 Graeme's book also revealed Kamm's systematic manipulations to alter beliefs and attitudes towards dictatorial self-serving control over the membership of his cult; and clandestine underage sexual rendezvous to boot....."